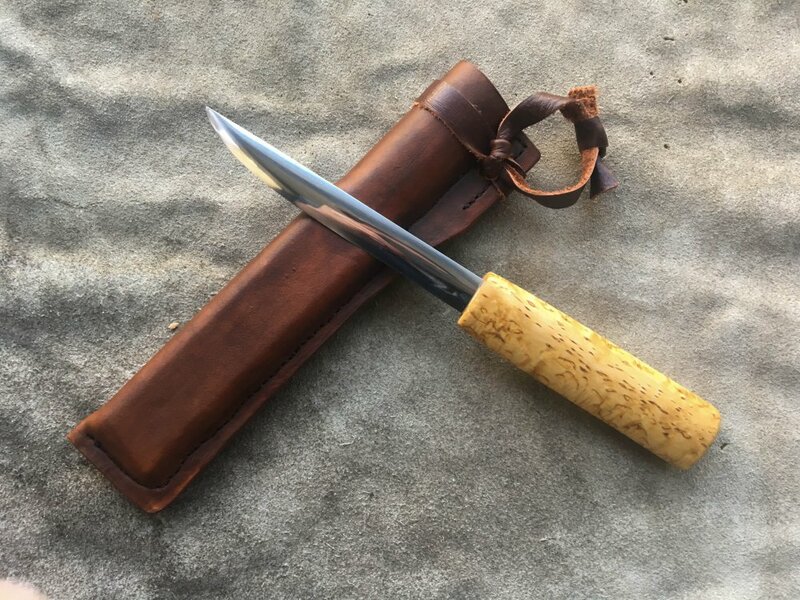 These knives are usually referred to as "Yakut" knives, but it seems like the people prefer to call themselves "Sakha" or "Saha" (though I don't know much about the issue), so for recognition I'm using "Yakut" in the title, but will say "Sakha" from now on. It's been very difficult to learn about these knives, and I've been trying my best to find pictures of originals, although they are buried in a sea of not-particularly-faithful modern versions. I had the best luck searching in Russian with the help of Google Translate and my girlfriend, who speaks Slovak/Czech and can sound out Cyrillic which has often been close enough for translating text which was in images/videos and/or hand written. I was able to get a nice clear groove, but couldn't find a good way to polish it, so for this knife I left it black. Is that every seen on historic examples? 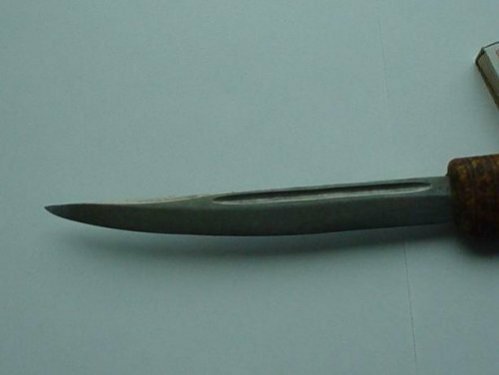 I have had a hard time finding pictures of old Sakha knives, and if someone knows of any good sources of information, I would be very interested in finding out more. Blade is 138 mm (5.4in) long, 17mm (0.68 in) wide, and 3.4 mm (0.15 in) thick. The handle is 118 mm (4.65 in) long, 31 mm (1.25 in) wide, and 22 mm (0.86 in) thick. 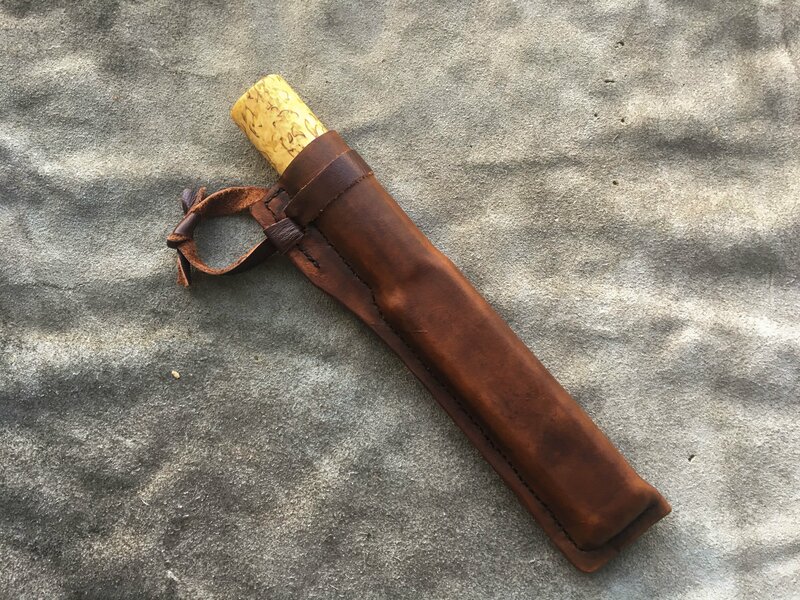 I like how the sheath turned out, but I don't think it is close to originals. I think I made the insert too large/square. This picture kind of shows the "egg" shape of the handle cross-section. This last pictures shows two earlier attempts. I wish the handle had come out a bit more like the one in the middle, I tried putting in a bit of a taper, but I think it ended up a little bit too small. 1) Is the overall profile (blade and handle) good, especially whether the handle is too narrow? 2) What is a good/accurate way to finish the inside of the fuller for future knives? 3) Is the blade too thin? It is rigid and doesn't have too acute of an edge, but still wondering. 4) How should the edge be aligned with the plane of symmetry of the handle? 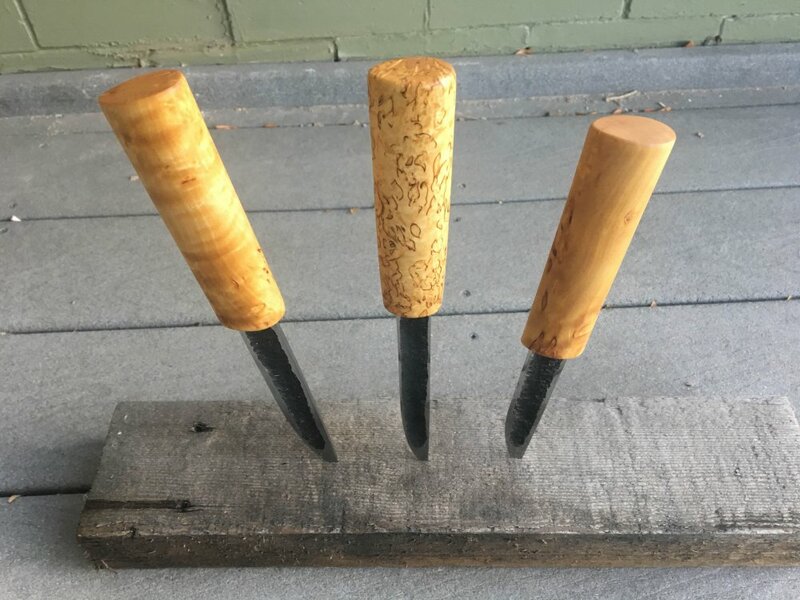 I gave mine a slight "angle of attack" (counter clockwise when looking down on the tip), to help it "bite" a bit more and not require as much wrist rotation. 4) Does anyone have recommendations for places to look for pictures/dimensions of and information about originals,? When replicating a style of knife, I usually like to have one to look at, hold, and measure, but I don't think that will be possible for this style. 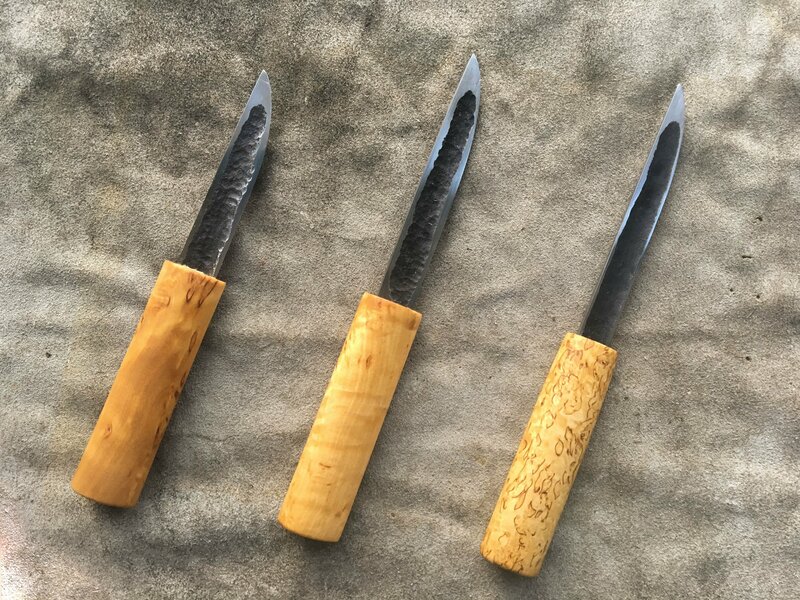 Over all, I very much enjoyed learning about and making these knives, and hope I can learn more and maybe also inspire some people to try out making these themselves. Aiden, several years ago on this forum there was a LOT of information on these. Jake Pogrebinsky was instrumental in translating, and we had several Russians who had opinions as well. As far as I remember, the fuller was never cleaned out, they left the scale and forging marks as they were. I saw a video once, I think it was on this forum, were the smith heated the blade and gently curved it away from the fuller. He was then able to use a file to clean it before he heated it again and gently straightened it. Thanks! I'll take a look at older topics here, I actually first found about these knives from Jake when he brought them up in a thread of mine about wedged handle construction. I'll have to try that, at least for projects with more narrow fullers. It seems like it would let you get more even sides and especially ends that just bending in a swedge block. Aiden,you're doing a good job of it all so far. There's lots of information available,but a very great deal of it is utter nonsense(for a number of reasons not worth going into). Again,i think that you're on a right track:You're a `wonderful artist,i really like your interpretation of all the puukot,so use that same sense on the Sakha knives,your artist's intuition is your best tool. After a while you'll be able to tell those false notes in the general din...(and then you'll know what i mean about many ambient info sources;especially untrustworthy are the ones in Russian,btw). Now more specifically...For once i disagree with Alan,and would say that historically the fuller was finished very smooth and even.As someone mentions`above-bend the hot forging and hot-file it smooth. There's quite a confusion in historic artefact collections caused by the all-pervasive soviet dysfunction...But it's`actually worse even than that,as the entire culture of Sakha people was systematically being degraded by the Russians over nearly 5 centuries,so many of the objects produced a Very long time ago looking back from today were already affected by this negative influence,and are not representative of the real,traditional work.It was a long,rough Colonisation period...That continues today. Do try to at least get a look at the illustrations in that AMNH book,those are the best original examples that are known today. 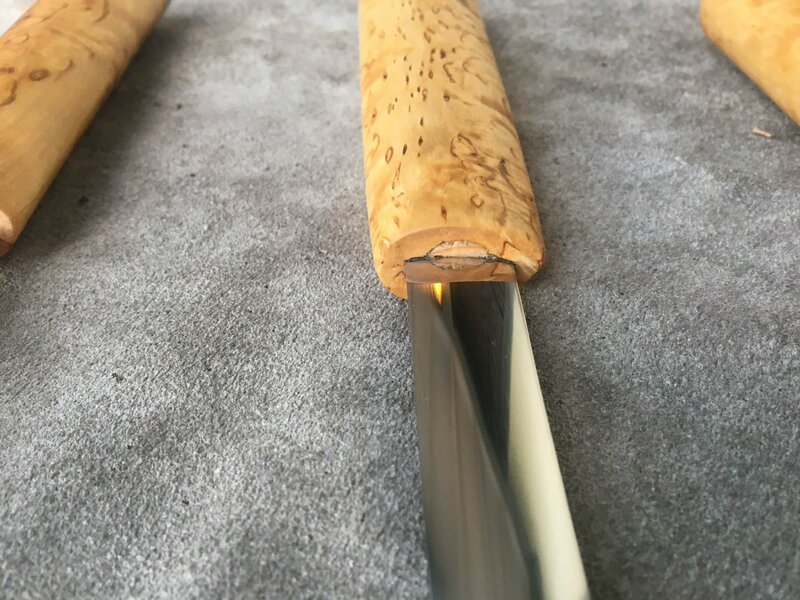 Many of the questions you ask cannot be answered unambiguously,as there were several(many) different styles,shapes,sizes and purposes for these knives,as well as regional differences. (i'd not hesitate to write and ask Alexey any of the specific structural et c questions,he's nice guy and totally into sharing the techniques). P.P.S. "Sakha" is the name of the people in their language,which is also Sakha. "Yakut" is a Russian perjorative term for those,but of such long duration that many have just given up and don't bother correcting. The word on a street also has it that this is a decent,informative study:Seroshevsky, V.L. Iakuty: Opyt etnographicheskogo issledovaniia [The Yakuts: Ethnographic Study Experience]. М., ROSPEN, 1993, 1, 713 p.
I'm not able to find a copy in English And the public domain,and am not sure if it'd be worth it buying one from Amazon or wherever.It does contain some information on knives. What pertinent info there is would lend itself well to an electronic translaton,i think. (the link above is not to that one specific epic i mentioned,but to illustrate somewhat the breadth and complexity of a culture we're discussing...i'll try to find the text to that certain one,if i can,and if so will translate those verses`referring to metallurgy.....). (i'd not hesitate to write and ask Alexey any of the specific structural etc questions,he's nice guy and totally into sharing the techniques). Thank you for the information! 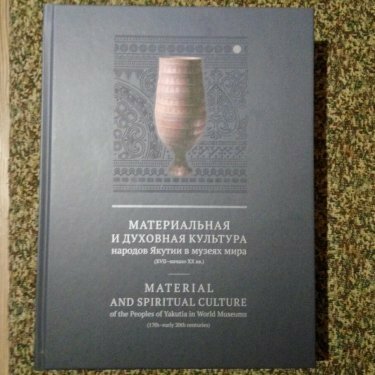 I've spent some time looking for the "Material and Spiritual Culture" book (using both the English and Russian title), but haven't had any luck finding a physical or digital copy anywhere (looks like only 2500 were printed). 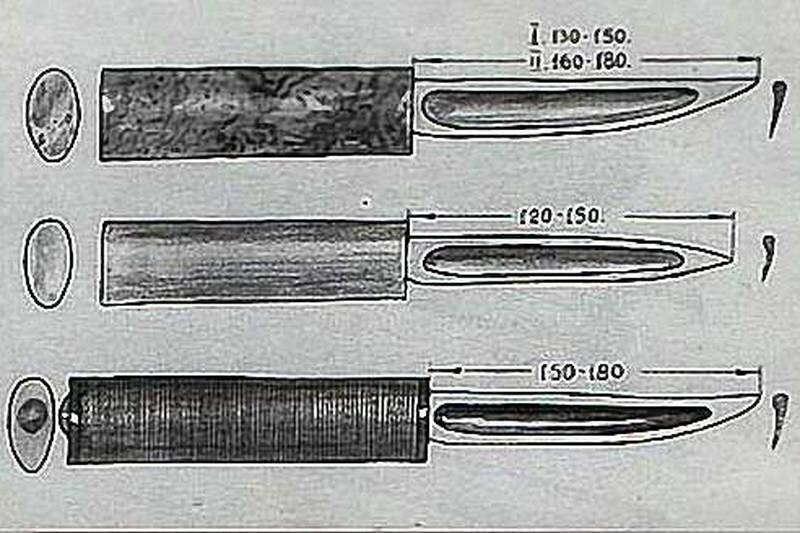 The book you sent a link to had some good information and I found one picture of the knives in it. I also watched some of Alexey's videos, and they are very helpful. It looks like for some of his knives he leaves scale inside the groove (though the inside is always smooth, either forged or filed)? I'll probably reach out to him to ask some questions. 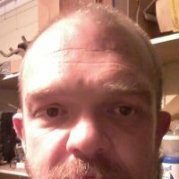 Is there a way/place that it is best to talk with him? I especially like the narrow knife in this one, and may try it. I like the shapes of all the knives in this image, and will probably use them for inspiration at some point. 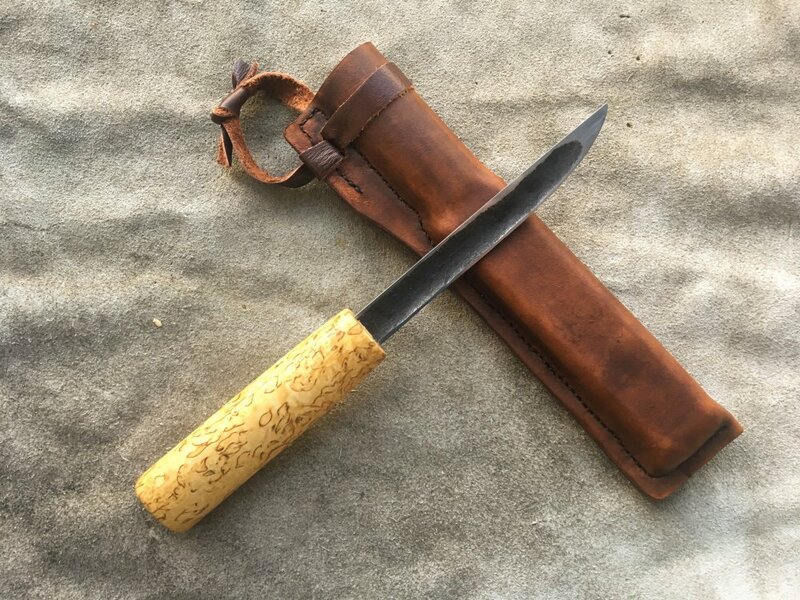 These are such a unique type of knife, that I've really enjoyed, and it also seems like they are tied in to a sense of regional pride/cultural heritage. When replicating old knives I like to put a bit of my own style/skills into the final product, but I try to stay fairly faithful to the original form/function. I'll probably reach out to him to ask some questions. Is there a way/place that it is best to talk with him? Aiden,i think his Instagram channel may be a good venue,also i believe that he pays fairly close `attention to the comments under his videos,you may try some of the more recent ones. Both of those photos are from a book about Sakha knives` published not too long ago there,in Sakha Republic.Typically for things published in RF it's a bit scattered,poorly organised/attributed. (i'll see if i can't find the rest of this book for you,it's not that many pages). 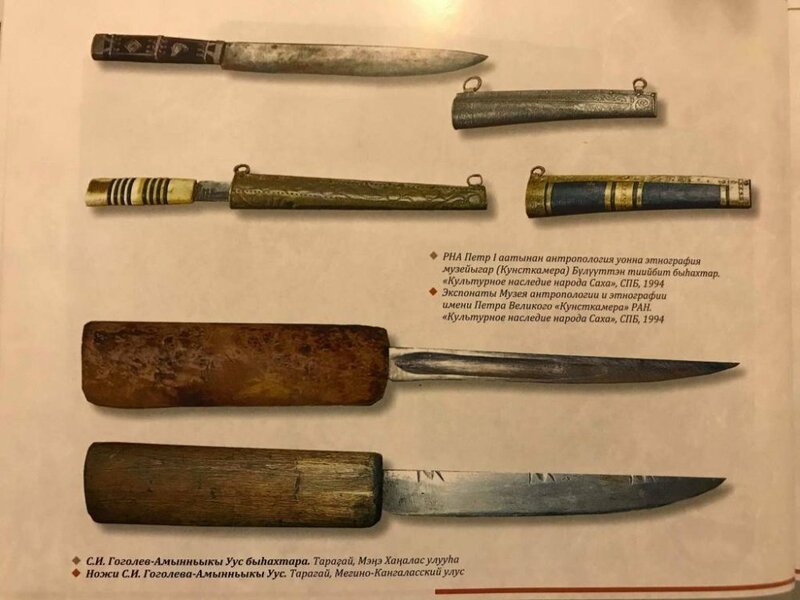 At the top of that first photo are knives from the collection of the so-called "Kunstkamera",Museum of Anthropology and Ethnography at St.Petersburg.Typically,they're not dated,or properly attributed,nor anything else that is normally done to artefacts.They appear to be the higher-status knives,belonging to wealthier traders or herders.The topmost one seems like a stray from an unrelated collection. Those ones on the bottom,with wooden handles,are by a renown Sakha maker S.I. Gogolev-Ammyn'nikty Uus,from Taragoi,in Megino-Kangalasskiy Ulus(region). So, why did these knives have the large fuller in them? What were they used for? 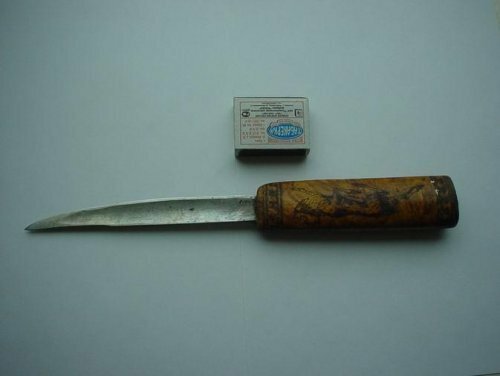 I've known about "Yakut" knives thanks to somebody posting photos from a Kiev knives show few years ago on another forum, always found them fascinating. @Conner Michaux if you asked me a week ago I'd regurgitate what I'd heard before, the fuller saves on steel. Now I think the truth might be much more than that. My guess for the fuller is ease of sharpening. Japanese chisels are hollow on the back for that reason. It makes flattening a lot easier when you're only removing metal on the edges.